Sealaska Heritage Institute (SHI) will hold a regional Native language summit for the remaining fluent speakers of Lingít (Tlingit), Xaad Kíl (Haida) and Sm’algyax (Tsimshian) living in Southeast Alaska and among the Interior Tlingit who share clan membership with the coastal Tlingit. 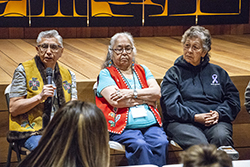 The three-day summit, Voices of Our Ancestors, is scheduled Nov. 13-15 in Juneau. SHI will cover transportation and hotel costs for fluent speakers and provide lunches to participants. SHI has sent letters of invitation to fluent speakers. Fluent speakers living in Alaska who have not received an invitation should contact Ralphenia Dybdahl at ralphenia.dybdahl@sealaska.com or 907.463.4844. SHI’s board of trustees authorized the event after hearing stories about Elders who were having trouble finding other people to converse with in their Native language. Speakers are calling others on the phone just to hold a conversation in their Native tongue, said SHI President Rosita Worl. Just over 100 Lingít, Xaad Kíl and Sm’algyax speakers remain in the region and the Interior of Canada. The institute will videotape the summit and the footage will be available to language learners through SHI’s archives. Sealaska Heritage Institute has been a leader in documenting and revitalizing Tlingit, Haida and Tsimshian languages. Soon after it was founded in 1980, SHI hired Tlingit speaker Nora Dauenhauer and Linguist Richard Dauenhauer to document the Tlingit language through their books Beginning Tlingit; Lingít X’éináx Sá! Say it in Tlingit—A Tlingit Phrase Book; Intermediate Tlingit; and Tlingit Spelling Book—Aan Aduspelled X’úx’. The Dauenhauers also produced two publications of oral traditions in Tlingit with English translations and the biographies of those who contributed the oral traditions. In ensuing years, SHI published the three landmark dictionaries used by Lingít, Xaad Kíl and Sm’algyax learners today plus other language books and materials. Twenty years ago, the Sealaska Heritage Institute’s Board of Trustees established language revitalization—as opposed to documentation—as its highest priority. SHI initiated its language revitalization effort knowing staff would first have to convince parents and grandparents to overcome the belief that they were harming their children's and grandchildren's future by speaking to them in Tlingit, Haida or Tsimshian and that they would, instead, have to learn to speak English if they were going to succeed in the world. SHI began its language revitalization efforts with the first of three Kusteeyí camps at the University of Alaska Southeast to which both speakers and language learners were invited. The objectives were to have the Elders and youth become comfortable in an academic setting and to establish the university as a domain for language learning. SHI also introduced a new teaching method that replicates natural language acquisition processes, replacing the old memorization approach. The need was great and included the imperatives to teach Native languages from pre-school to college; train speakers and language learners in pedagogical approaches; develop curricula and materials; create language habitats; document Native speakers; transcribe and translate recordings; find funding; and convince elementary, secondary and post-secondary educational institutions to integrate language instruction into the classroom. A dedicated team of language learners, who had also acquired their teaching certificates, began sharing their knowledge in schools and communities throughout the region. Sometimes the young teachers were assisted by an Elder who had gone through SHI’s Kusteeyí workshops, but they were few in number primarily for the lack of funding. In recent years, SHI founded its Haa Shuká Community Language Learning Project, which seeks to revitalize the languages of the Tlingit, Haida and Tsimshian in four Southeast Alaska communities, including Metlakatla, Hydaburg, Sitka and Juneau. The new project pairs fluent speakers of Lingít (Tlingit), Xaad Kíl (Haida) and Sm’algyax (Tsimshian) with intermediate and advanced speakers in those languages to increase learner proficiency. Throughout this period, we have seen the number of Native speakers gradually decrease year-by-year. And as the years have gone by, the loss of speakers has accelerated as the Elders have moved into their more senior years. Each passing of a speaker is publically mourned. Through the collective efforts of Native entities and schools, we have made considerable progress in our language restoration efforts. Language programs are available in most all of our Southeast Alaska communities and schools. Parents are speaking to their children in their Native language. Children are integrating Native words into their vocabulary. Considerable publications, curricula and materials are available. During Celebration 2018, Tlingit, Haida and Tsimshian were spoken more than any previous Celebrations save that of the first Celebration in 1982, Worl said. Caption: Fluent Tlingit speakers/teachers at SHI’s 2018 Tlingit immersion event. From left: Paul Marks, Florence Sheakley and Ruth Demmert. Photo by Jill Meserve, courtesy of Sealaska Heritage Institute.